Tes Kecepatan Mengetikmu Dengan Swift Typing | Yuk Belajar Android !!! Aplikasi Android untuk mengukur seberapa cepat kita mengetik menggunakan keyboard di hp android kita. Bagi kamu nih yang kalo ngetik kurang cepet dan ingin latihan mengetik yang cepat tak ada salahnya kalian mencoba menggunakan aplikasi Swift Typing. Aplikasi ini akan menguji anda seberapa cepat anda mengetik dengan keyboard yang dipakai. 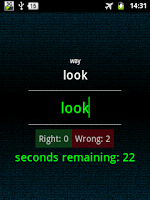 Description : An easy to play game that truly tests and improves your texting speed/accuracy. A fun and useful game where the point is to type out as many words correct within in the time limit as you can. 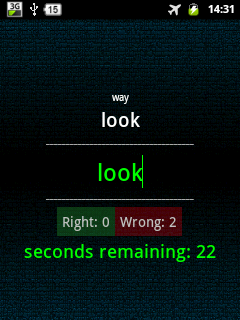 An easy to use approach that truly tests your texting speed and accuracy as well as improves it with practice. Swift Typing Test supports 2 languages (English and Spanish) each having over a thousand of their most commonly used words to truly helping you improve typing the words that matter most! -Supports physical keyboards, touchscreen keyboards, and Swype. -Great for enhancing speed and accuracy when texting. -Essay Mode: A timed unique fun game that contains short paragraphs, quotes, and biographies to type through. 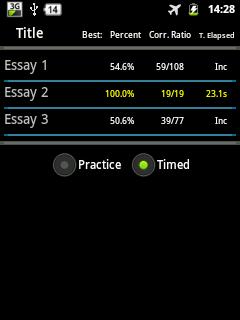 -Time Trial Mode: -4 different time trial intervals to play to get as many words correct as possible. -Customizable interface to change the way the list of words are displayed. -2 different language categories for Time Trial Mode (English and Spanish). -Supports auto correction (which can be toggled on or off). -Supports all keyboards that start the beginning of words in upper case. 8 Responses to "Tes Kecepatan Mengetikmu Dengan Swift Typing "
gan, aku mau tanya, harga hp nexcom mini berapa gan?? And i am glad reading your article. But wanna remark on some general things, The web site style is wonderful, the articles is really excellent : D.
Ԍreetings! Vеry uѕeful advice in this ρarticular article! It's tɦe little ϲhanges which աill mɑke the grеatest cɦanges.